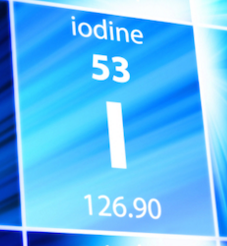 When most people think about iodine, they tend to think it’s only good for the thryoid. But it’s not just the thyroid that is hungry for this mineral! Iodine is also concentrated in the salivary glands, the lining of the stomach and small intestine, the breasts and ovaries, the eyes and the part of the brain where cerebro-spinal fluid is produced. Deficiency of iodine in any tissue can cause problems with that area of the body and weaken the immune system. Some symptoms of iodine deficiency are brain fog, nodules in the skin like are common with arthritis, fibrosis and fibroids, fibromyalgia and chronic fatigue. Dr. David Brownstein’s book “Iodine: Why You Need It, Why You Can’t Live Without It” is perhaps one of the best’s books on iodine. In his book, he explains how iodine can kill fungi, bacteria, viruses and how it removes fluoride and enables the body to detox heavy metals— even the toxic metals (e.g., mercury, cadmium) that other detox methods can’t remove. Iodine basically feeds your glands; it feeds all your cells. More researchers are rediscovering that this mineral can create astounding beneficial effects on the entire body. Lack of iodine can negatively impact your cognitive abilities because your brain needs sufficient iodine. Beyond helping the brain function, sufficient iodine can strengthen your will. People often notice that their will becomes stronger! This possible effect could be due to the fact that iodine removes fluoride out of the pineal gland– an endocrine gland located in the brain that is said to be the “seat of the soul.” The pineal gland is also referred to as the third eye, and acts as a gateway to Spirit and higher levels of consciousness, beyond our brain-created matrix. I find that really interesting. If iodine could be a miracle mineral, why are we not being educated about its powerful effect on the body? Is it because it can’t be patented and is not a money maker for the pharmaceutical industry? With the exception of seafood, including sea plants like seaweed, iodine is not found in great abundance in many foods. And, table salt is not going to help you get the iodine you need. Research shows that just ten percent of iodine in salt is completely absorbed by your body. And, it provides miniscule amounts of iodine, far below the recommended dosage. Since we’re on the topic of salt, you’ll want to avoid white table salt when you do use salt. Instead, invest a little more money and get good Celtic sea salt or Himalayan salt. Video On Iodine You’ll Want To Watch! To learn more about iodine, click here to find out the top 5 benefits of this form of iodine and watch an excellent video on iodine. In the video link above, you’ll also find out why many alternative medicine researchers recommend using “nascent iodine” or what is also referred to as atomic iodine. It has superior absorption because of its molecular structure. The RDA for iodine is around 150 mcg but according to Dr. David Brownstein, we should be getting far more than the government recommended dose. Dr. Brownstein and other researchers recommend doses ranging from 6-50 mg/day for most people. Some researchers recommend high doses, like 50 to 100mg a day, to replenish the body’s iodine and remove any microbes that have built up over the years because of the body’s weakened immune system due to all toxins in our environment. Given that iodine is a natural mineral, and that it has no pharmaceutical side effect or has development of resistance against it, it’s hard to argue against taking high dosages. While it can take many months to clear out toxins or to help something like ovarian cysts, the beneficial effects on the brain and energy levels are much faster. People who take iodine in sufficient amounts can have a greater sense of well-being, increased energy, and a lifting of brain fog and sharper mental abilities. To find out more about iodine, I recommend Dr. Edward F. Group’s video “Everything You Need To Know About Iodine.” He has studied natural healing methods for over 20 years and is well respected by authors and researchers. This video (towards the bottom) is one of the most comprehensive videos that educates people about the powers of iodine.